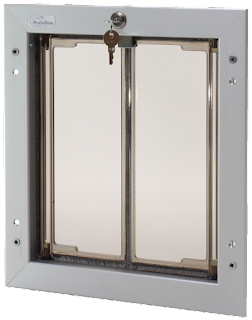 Plexidor Pet Doors: Never replace pet door flaps again! When asked about pet doors, many pet owners mention the hassle of replacing flaps. Regular rubber or plastic flaps tend to break with wear and tear. Sunshine and other extreme weather can make the material brittle, and many dogs like to chew on them. If you recognize yourself in this experience, read on and learn how you'll get away from having to replace flaps in your pet door. The PlexiDor dog doors and cat door are equipped with shatter resistant panels. The cat door has one small pane, and the dog doors have saloon style panes that open and close so easily that large and small pets can use the same door. The panels open with a gentle push and close automatically through heavy-duty springs concealed in the frame. The panels close without banging, so they won't disturb the family or scare the pet. Since the panels are made from a specially formulated shatter resistant thermo-pane hardened acrylic, they can withstand much more than a regular flap - and they keep weather outside. Each panel is surrounded by a high density nylon weather seal. Many other pet doors are made from plastic, but the PlexiDor frame is made from anodized aluminum that won't rust, bend, crack, or warp. The frames come in silver, white, or bronze. If you have any questions about the PlexiDor, don't hesitate to call customer service at 800-749-9609. Or, visit the main website for more information. If you have a pet door, do you consider replacing flaps a problem? How often do you replace them? I'm such a huge fan of our PlexiDor - my boyfriend recommended it to a friend this past weekend. After replacing 2 doors and constantly buying those flaps, switching to PlexiDor was a great improvement.